Thousands of people have been arriving for the Great Dorset Steam Fair near Blandford in Dorset. There have been long delays to get into the showground. 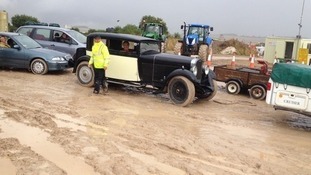 Organisers of the Great Dorset Steam Fair say it was a huge success despite a muddy start. Visitors praised a special World War One exhibit recreating life in the trenches. Rain at the start of last week caused boggy conditions. But the ground dried up by the weekend and sunshine help bring in the crowds.